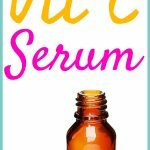 DIY Coconut Oil and Vitamin E Eye Cream - beautymunsta - free natural beauty hacks and more! Beauty woes that affect the eye include dark circles, puffy eyes and wrinkles around the eyes. How do we combat all these? 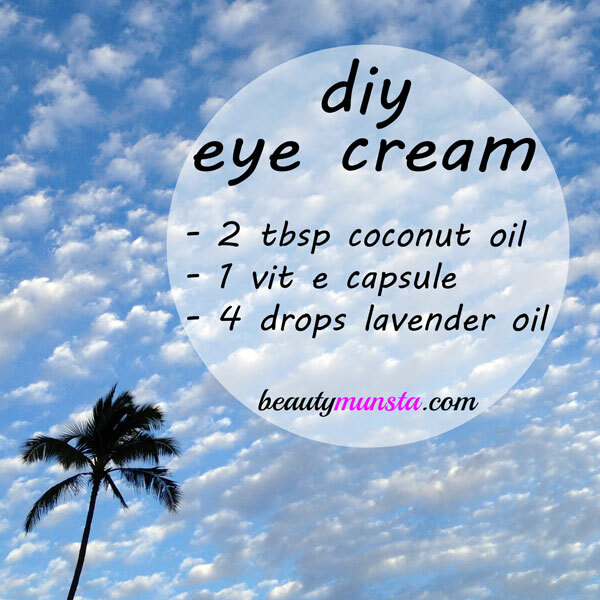 By making a DIY coconut oil and vitamin E eye cream! Coconut oil and vitamin E are good options for a simple but effective eye cream. 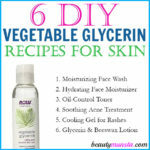 They are very good emollients that help keep skin moisturized. They are also loaded with antioxidants that prevent premature wrinkles from forming around the eyes. What makes coconut oil good for under eye skin? Has small molecules that easily penetrate into the thin under eye skin. Rich in medium chain triglycerides that lubricate and moisturize skin. 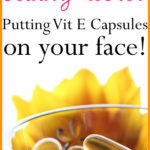 What makes vitamin E good for under eye skin? Fights off free radicals that causing under eye aging. Keeps skin silky smooth and soft. Good for reducing discolorations including dark circles. Mix and mash up the coconut oil and lavender oil in the 2 oz container with a small spoon/popsicle stick. Then puncture a vitamin E capsule and squeeze out the oil into the mixture. Stir the mixture very well until everything is well combined and it’s done! 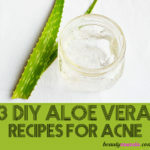 Store it in the 2 oz container and use a tiny amount under each eye before bed. Clove oil – Clove oil is great for dark circles, reducing discoloration and promoting proper blood circulation. Geranium oil – A flowery oil that’s good for balancing skin, hormonal problems and women’s troubles, geranium is excellent for treating under eye puffiness. This is because of its diuretic properties that help promote drainage of excess fluids. If you want your coconut oil and vitamin e eye cream to be light and fluffy, go ahead and whip it up! You will need a hand mixer and about 5 minutes to beat it into a creamy mix. Want to add essential oils like clove or geranium? Use the rule 1 drop of oil in 1 tsp of eye cream. When applying the eye cream, use your ring finger because it is the weakest so it creates the least pressure that’s good for applying something to the thin skin under the eyes. Always do patch tests with essential oils on your inner elbow before using them. Just mix up 1 drop of essential oil in 1 tsp of coconut oil and rub it on your inner elbow. If no reaction happens within an hour or two, then it’s safe to be used. Only apply the eye cream under your eyes not around. You don’t want it to enter your eyes because it can burn. 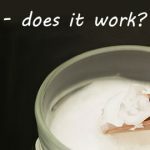 Can you Use Coconut Oil for Skin Whitening?